F Adam Courchaine (Medicine Hat, Vancouver, 2001-05) has signed for the rest of this season with Olten (Switzerland, NL B). This season, with the Krefeld Pinguine (Germany, DEL), he had 11 goals and 12 assists in 27 games. He was released at his request by Krefeld on Jan. 13. 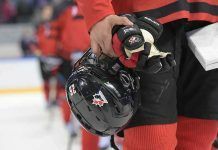 The Moose Jaw Warriors fired Rob MacLachlan, their assistant general manager and head scout, on Friday. Is hockey under siege in the state of Minnesota? Cory Zurowski of City Pages has a terrific read right here that takes a look at lots of happenings in Minnesota hockey circles. In Regina, F Jack Rodewald scored at 3:44 of OT to give the Moose Jaw Warriors a 4-3 victory over the Pats. . . . Attendance was announced at 6,484 on a night when the Pats unveiled their new scoreclock/video screens. . . . Rodewald’s 22nd goal came via the PP. . . . Regina had won 11 straight games over the Warriors. . . . The Warriors led 3-1 with five minutes to play in the third period. . . . Regina F Taylor Cooper scored his 19th goal, on a PP, at 15:10 and F Pavel Padakin tied it, with his 14th, at 16:26. . . . Regina G Daniel Wapple stopped 35 shots, 17 more than Moose Jaw’s Zach Sawchenko. . . . Moose Jaw D Dustin Perillat had two assists, while Rodewald, F Jaimen Yakubowski and Axel Blomqvist each had a goal and an assist. . . . Cooper also had an assist for the Pats, while D Chase Harrison had two assists. . . . The Warriors were 2-for-6 on the PP; the Pats were 1-for-5. . . . The Warriors (20-24-4) have won two in a row. They are to play in Saskatoon tonight. . . . The Pats (26-16-5) have lost four straight (0-2-2). They’ll play in Brandon tonight. . . . A post game tweet from Warren Woods of Regina radio station CJME: “Pats HC John Paddock says they were fortunate to get a point tonite but were ” screwed by the officials” in OT. . . . Ch-ch-ching! . . . 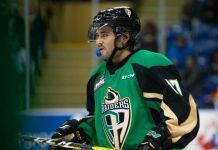 I n Brandon, F Tanner Kaspick’s first goal of the season stood up as the winner as the Wheat Kings dumped the Prince Albert Raiders, 4-1. . . . Kaspick’s goal, at 16:45 of the first period, gave Brandon a 2-0 lead. . . . F Tim McGauley, in his 200th regular-season game, scored twice for Brandon, giving him 29 this season. He scored the game’s first and last goals. . . . The Wheat Kings opened a four-game homestand with this one. . . . Wheat Kings F John Quenneville and D Eric Roy each had two assists. . . . Brandon G Alex Moodie stopped 31 shots, one more than Prince Albert’s Rylan Parenteau. . . . Brandon F Braylon Shmyr came up short on a penalty shot 37 seconds into the game. . . . The Wheat Kings continue to play without F Jayce Hawryluk and D Kale Clague, while the Raiders scratched two of their leading scorers in D Craig Leverton and F Simon Stransky. . . . The Wheat Kings (34-9-4), who entertain Regina tonight, have won five straight. They continue to lead the Eastern Conference and are one point behind Kelowna, which leads the overall standings. . . . The Raiders (19-26-1), who won’t play tonight, have lost three straight. . . . In Calgary, G Mack Shields earned his first shutout of the season as the Hitmen beat the Swift Current Broncos, 8-0. . . . Shields stopped 24 shots. He also picked up his seventh assist of the season. He holds the franchise’s career record, with 13. . . . F Radel Fazleev scored his 14th goal 14 seconds into the game and the Hitmen were off to the races. . . . F Terrell Draude scored twice, giving him six goals, and added an assist. . . . F Kenton Helgesen got his 13th goal and had two assists, while F Adam Tambellini scored his 30th goal. . . . D Jake Bean scored his third goal and had an assist, and was plus-5. . . . D Travis Sanheim had one assist and also was plus-5. . . . Broncos D Dillon Heatherington left in the first period with an undisclosed injury. . . . Calgary D Colby Harmsworth returned after missing 19 games with a knee injury. . . . The Hitmen (25-17-5) have won two straight. They will travel to Edmonton tonight. . . . The Broncos ((21-21-5), who play in Cranbrook tonight, have lost two in a row. . . . In Lethbridge, G Cody Porter turned aside 20 shots to help the Vancouver Giants to a 3-2 victory over the Hurricanes. . . . Vancouver F Alex Baer broke a 1-1 tie with his 10th goal at 19:45 of the first period and F Carter Popoff upped the lead to 3-1 with his 18th goal, on a PP, at 16:26 of the second. . . . F Tyler Wong scored both goals for Lethbridge, giving him 18. . . . Both of Wong’s goals came via the PP as the home side went 2-for-6. . . . D Arvin Atwal had two assists for Vancouver. . . . F Zane Jones, acquired from Lethbridge at the trade deadline, scored for Vancouver. He’s got 21 goals, three of them with the Giants. . . . 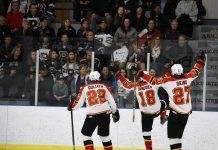 The Giants were 1-for-2. . . . Lethbridge G Stuart Skinner stopped 25 shots. . . . Lethbridge remains without F Jamal Watson, its captain, who is out with an undisclosed injury. . . . The Giants (20-25-2), who are in Red Deer tonight, had lost five in a row. They now are tied with Prince George and Kamloops for third place in the B.C. Division. . . . The Hurricanes (10-28-6) now have lost five straight. They are at home to Prince George tonight. . . . In Medicine Hat, F Curtis Sanford scored twice to lead the Tigers to a 5-1 victory over the Prince George Cougars. . . . Sanford, who also had an assist, now has 39 goals, tying him with Kelowna F Rourke Chartier for the WHL lead. . . . Tigers F Trevor Cox, who leads the WHL points race, scored his 19th goal and added an assist. He has 78 points, eight more than Sanford. . . . Tigers F Dryden Hunt notched his 21st goal and also had an assist. He now is on an 18-game point streak, the longest in the WHL this season. . . . F Markus Eisenschmid scored his 13th goal and also had an assist for the winners. . . . Tigers D Kyle Burroughs took a headshot major and game misconduct at 4:19 of the third period for a hit on Cougars F Jari Erricson. . . . The Tigers (32-12-2) have won three in a row. They’re off tonight. . . . The Cougars (20-27-2) have lost eight in a row (0-6-2) and now are tied with Vancouver and Kamloops for third in the B.C. Division. . . . Prince George goes into Lethbridge tonight. . . . In Portland, F Chase De Leo scored twice to help the Winterhawks to a 4-1 victory over the Spokane Chiefs. . . . De Leo, who has 20 goals, scored twice in the second period as Portland extended its lead to 4-0. . . . F Paul Bittner scored the game’s first goal, giving him 20 this season. He also had an assist. . . . Portland F Oliver Bjorkstrand drew two assists. . . . Portland G Adin Hill stopped 33 shots. . . . Spokane G Garret Hughson made 27 saves before being ejected at 15:10 of the third period after becoming mixed up with Portland F Keegan Iverson. . . . The Winterhawks (26-19-3) have won three straight. . . . Spokane (23-18-4) has lost four in a row (0-3-1). . . . The Winterhawks will meet Seattle in Kent, Wash., tonight, while the Chiefs are at home to Tri-City. . . . In Kelowna, F Tyson Baillie scored twice as the Rockets got past the Everett Silvertips, 5-3, in a matchup between the Western Conference’s division leaders. . . . They’ll play again tonight in Kelowna. . . . Baillie has 29 goals this season. . . . Rockets F Rourke Chartier broke a 1-1 tie with his 39th goal, via the PP, at 6:49 of the second period. . . . Baillie stretched the lead to 3-1 at 1:19 of the third period. . . . F Leon Draisaitl had three assists for Kelowna, while D Josh Morrissey picked up two. . . . Kelowna F Tyrell Goulbourne scored his 15th goal and added an assist. . . . Everett F Ivan Nikolishin scored his 12th goal and had two assists, while F Patrick Bajkov picked up his 16th goal and had an assist. . . . Kelowna G Jackson Whistle stopped 28 shots, seven more than Everett’s Austin Lotz. . . . Kelowna was 2-for-2 on the PP; Everett was 1-for-4. . . . The Rockets (35-8-3) lead the Western Conference and the B.C. Division. . . . The Silvertips (30-13-4), who had a six-game winning streak snapped, lead the U.S. Division. . . . In Kennewick, Wash., G Evan Sarthou stopped 25 shots to help the Tri-City Americans to a 4-0 victory over the Seattle Thunderbirds. . . . Sarthou, who was making his 18th straight start, has posted three shutouts in his last four starts. He has five shutouts this season. . . . Seattle has been blanked in each of its last two games. . . . F Parker Bowles scored twice, giving him 12, and added an assist, while F Richard Nejezchleb and D Parker Wotherspoon each had two assists. . . . Bowles was playing his third game since being out since Jan. 2 with an undisclosed injury. . . . F Beau McCue scored the game’s first goal, his 17th, at 11:35 of the first period and also had an assist. . . . Tri-City D Riley Hillis returned after being out since Jan. 2 with an undisclosed injury. . . . Seattle F Mathew Barzal played for the first time since Nov. 4. He had been out with a knee injury. . . . Seattle F Ryan Gropp and Tri-City D Brandon Carlo didn’t play as they weren’t able to get back from the Top Prospects game in time. That game was played in St. Catharines, Ont., on Thursday night. . . . The Americans (23-22-2) are fifth in the U.S. Division, one point behind Seattle and two in back of Spokane. . . . The Americans travel to Spokane tonight, while Seattle is at home to Portland. . . . In Victoria, D Ryan Rehill scored at 1:25 of OT to give the Kamloops Blazers a 4-3 victory over the Royals. . . . Rehill snapped a shot from the top of the left circle that got through G Coleman Vollrath. . . . After scoring four goals in 118 games over his first two sesaons, Rehill has six goals in 45 games this season. . . . Attendance was announced as 7,006. . . . F Quinn Benjafield, a 16-year-old freshman, had his first two-goal game for the Blazers. His third goal of the season, at 15:21 of the third period, forced OT. . . . F Matthew Phillips of the Royals, playing his first WHL game, gave his side a 3-2 lead at 13:55 of the third. Phillips, the 33rd overall pick in the 2013 bantam draft, is from Calgary where he plays for the midget AAA Buffaloes. . . . Vollrath stopped 41 shots, 13 more than Kamloops’ Connor Ingram, who has started seven of his club’s last 10 games. . . . Kamloops D Michael Fora suffered an undisclosed injury in the first period and didn’t play in the last two periods. . . . The Blazers (18-24-6) have won four in a row, the first time they have won more than two straight this season. 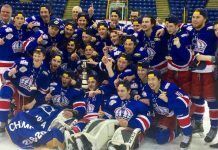 The run has pulled them into a tie with Prince George and Vancouver for third place in the B.C. Division. . . . The Royals (25-19-4) had won their previous five games. . . . The Blazers and Royals will play in Victoria again tonight.